Celestite (aka Celestine) Crystallizes both in tabular and prismatic crystals. It can also be found in massive granular or fibrous forms. Celestite is a strontium sulfate and is very fragile with a hardness of only 3 to 3.5. The coloration of this crystal can appear anywhere from colorless, white, blue, grey, orange, red, or brown. Celestite is most commonly found in Madagascar, Egypt, Poland, Peru, Libya, Mexico, UK, and US (Ohio). The most commonly found color of this stone is a gray-blue variety from Madagascar. This variety is usually found in clusters and geodes. Celestite has an uplifting energy that aligns one with higher realms of awareness. Here, one can sense strongly the presence of his/her spirit guides and higher self. It is most popularly known for its ability to align one with the angelic realm. 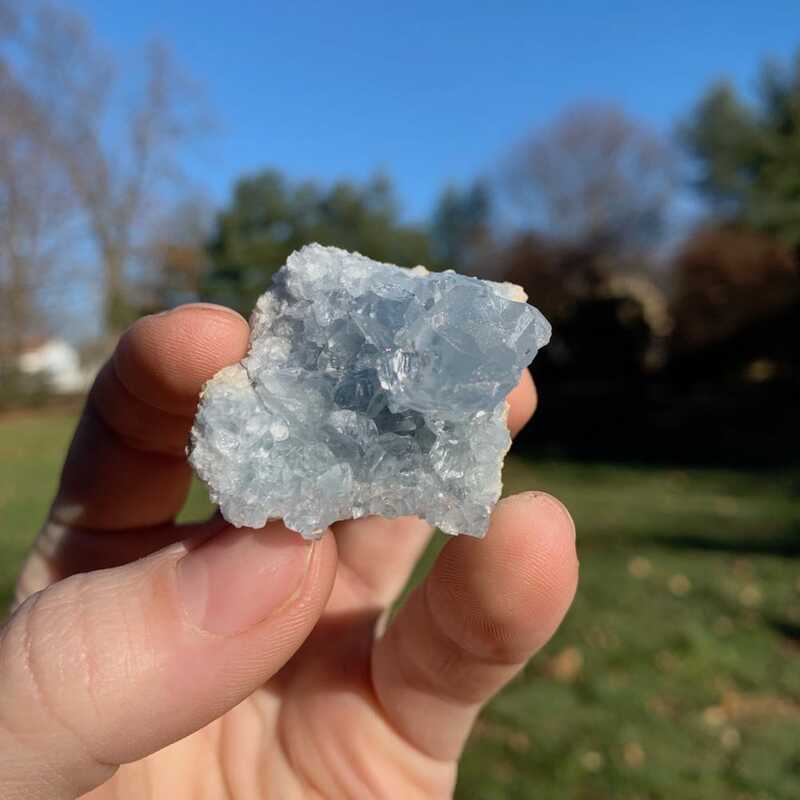 Celestite fills its environment with divine energy, encouraging spiritual awakening and development of metaphysical abilities. Meditating with Celestite pieces on the throat, third eye, heart and crown chakra will ease one into an effortless state of meditation. It assists efficiently in clairaudience, allowing one to hear the messages of the higher realms. Celestite will also assist one to in achieving states of lucid dreaming or astral travel. This stone offers soft vibrations that stimulate the higher chakra systems. The Third Eye, Crown and Etheric chakras begin to slowly turn in a clockwise fashion, bringing us to higher states of awareness at a manageable pace. 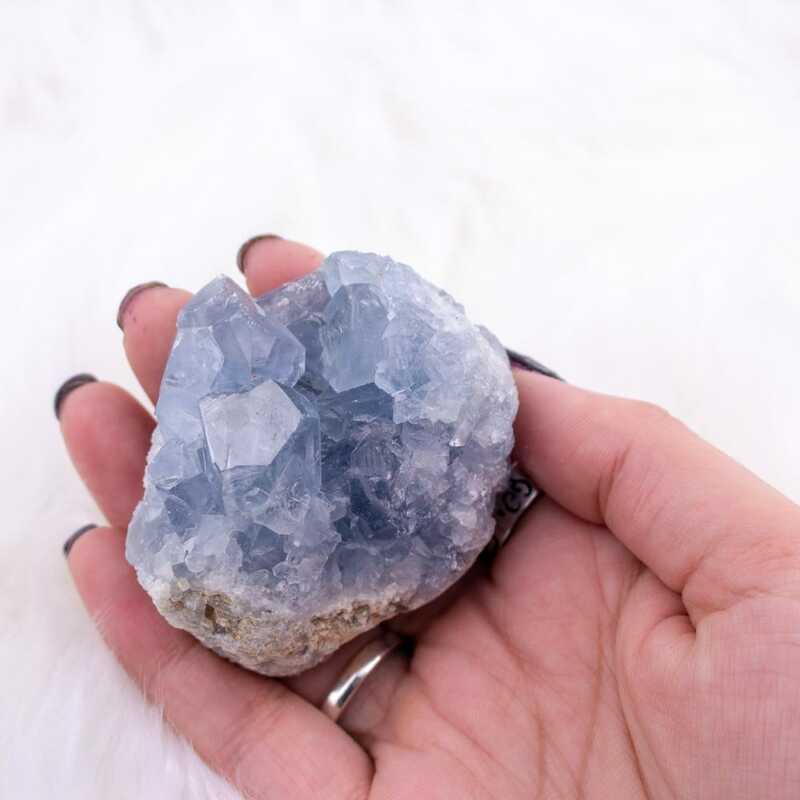 Unlike other high energy stones that send us on a blast toward higher frequencies, Celestite allows us to float at a softer pace toward higher vibrational awareness. This awareness is better known as Cosmic Awareness or attunement with The Existence. 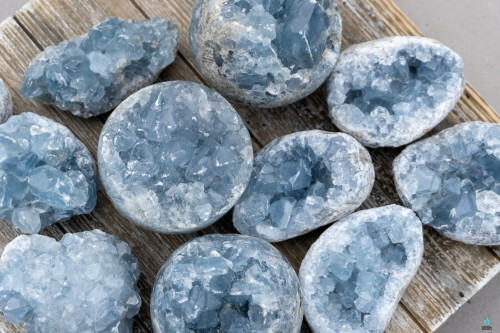 Celestite is extremely beneficial for healing the aura and is able to preserve a peaceful atmosphere. This is especially helpful in times of stress or chaos as it will open those around it to remain calm and develop greater trust in the wisdom of the Divine. It helps to find and maintain purity of the heart so that one may speak and act in accordance with their heart’s purest intentions. Through finding the inner purity of the heart, one may easily align with the highest good of oneself. 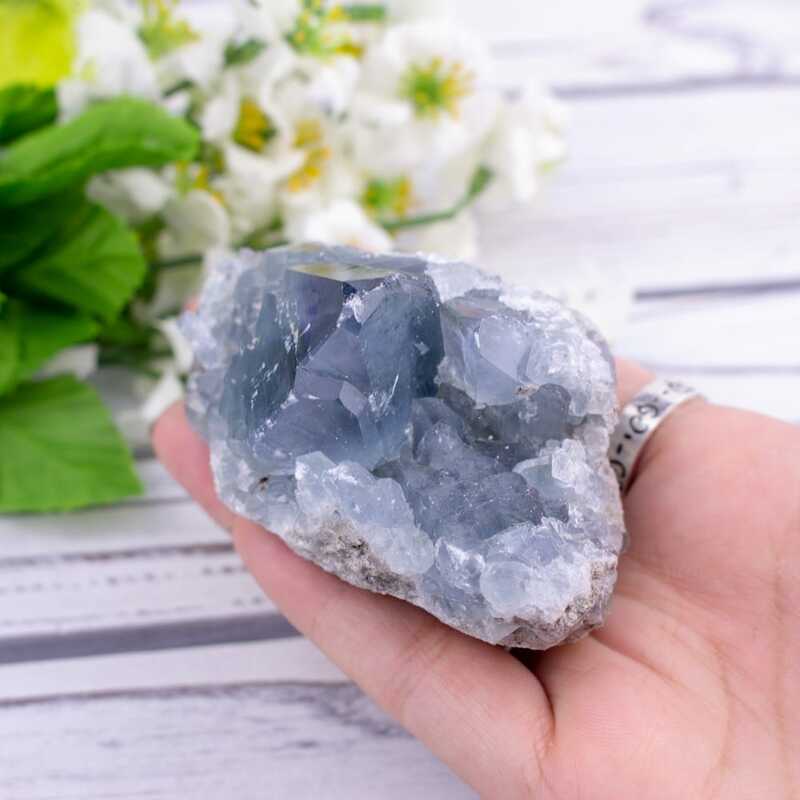 The calming vibrations of Celestite are beneficial for cooling fiery emotions and bringing one’s instincts into attunement with their higher intellect. This allows for a fusion of mental and emotional clarity. The clarity received from this stone allows one to see and speak their inner truth with a sense of serenity. Seeing with such clarity allows for the genuine expression of the most authentic self with no ego or blocking belief systems. Celestite aids in negotiations and can bring peaceful conclusions to dysfunctional relationships. It pushes one towards openness of new opportunities and experiences so that they may grow further, and move on from any emotional restrictions of the past. This aids in dispelling mental torment and guides one towards the path of higher thought.